Particularly musical guests at a reception given by Deputy Mayor Martin Pantke in Paderborn Town Hall. Martin Pantke gave a talk on notable aspects of the town of Paderborn to the Motettenchor Paderborn, the Romsey Singers from England as well as a deputation from Collegium Cantorum Holzminden. 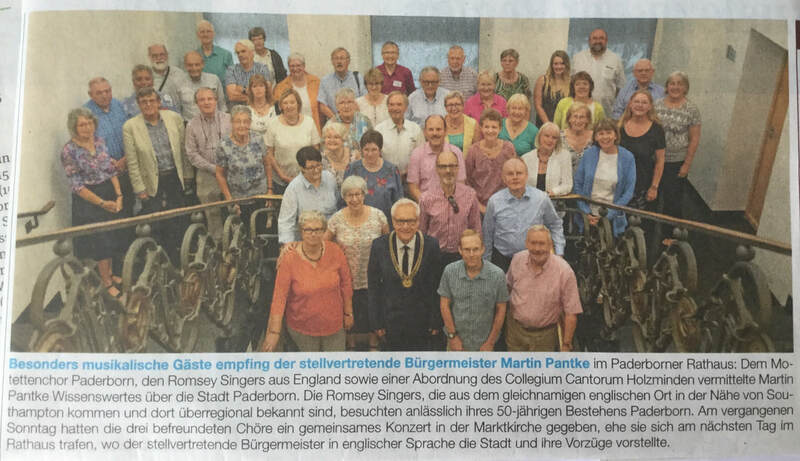 The Romsey Singers, who come from the English place with the same name in the region of Southampton and are known throughout that region, visited Paderborn on the occasion of their 50th anniversary. On the preceding Sunday, the three choirs gave a joint concert in the Marktkirche, before meeting again the next day in the Town Hall where the Deputy Mayor gave a presentation in English on the town and its merits.